A video has been shared online which shows karma at work. 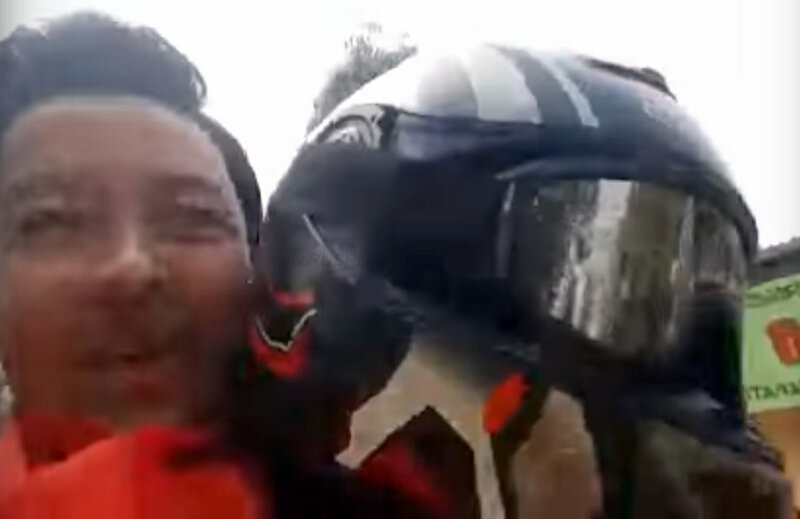 A video published by Youtuber Aayush baraily shows two youngsters astride a new KTM Duke 390. Within seconds, the rider slows down and is seen taking the bike on the side of the road, as if he was going to stop the bike. But he does not. Instead, he is slowing down to aim and ride his bike over a duck which was walking on the side of the road. After riding over the duck, the KTM Duke 390 rider start racing on the road and is riding dangerously. 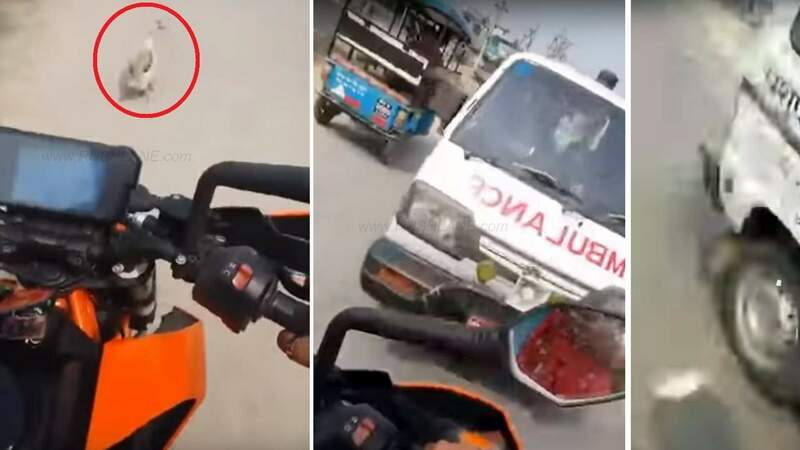 Within seconds, he crashes head on into an ambulance, which has the words Pashu written on it. The two who ran over a duck, and crashed into ambulance. Two wheeler accidents are on rise, especially the one where racing or high speed riding is involved. Just a few weeks ago, there was a dangerous accident video that was shared online. Two youngsters were killed on the spot when their sportsbike rammed into a road divider and then hit an electric pole. The deceased were identified as PMV Yashwanth (21) and M Hrithik Chowdary (20) pursuing BTech and BBA at KL University respectively. The duo were out to attend a friend’s birthday party and were returning home at around 5 am on Sunday morning. As per the CCTV footage, the two were riding at a very high speed of over 150+ kmph, says Police. They met with an accident near a petrol bunk at Moghalrajpuran in Vijaywada, received grievous head injuries and died on the spot. The impact was such that the bike was flung 150 meters away from the spot and wreckage was scattered around. They were not wearing protective riding gear. The cops at Machavaram Circle, headed by Inspector K Umameshwara Rao, stated that Yashwanth and Chowdary were astride a KTM Duke 390cc sports bike which was travelling at a speed of 170 kmph. They can confirm this because this is the last recorded speed on the speedo, says the cop. The KTM Duke 390 in question, was not theirs but borrowed from a friend. They were headed towards Janni Chettu Center when the two wheeler rammed into a road divider and then hit an electric pole. The police collected identification from their wallets and informed their guardians. The bodies have been shifted to the government hospital for postmortem while it is yet to be ascertained if the two were under the influence of alcohol. According to the family wishes, the eyes of Yeshwant have been donated. Often, people blame the machine. But in reality, it is the rider or circumstance to be blamed. Due to an aggressive price, KTM Duke 390 is being purchased by many inexperienced riders. Such accidents brings into focus the dangers of crossing speed limits while on fast and powerful bikes. It also draws attention to the urgent need to instill safer driving techniques for youngsters and the need for wearing helmets / riding gear which could reduce the impact and damaged caused during such high speed accidents.